Menlo School student Leo Jergovic is an award-winning songwriter and musician. Photo by Pete Zivkov/courtesy of Jergovic. Leo Jergovic's songwriting journey may have begun just one year ago but his foundation as a musician has been years in the making. Jergovic, a 15-year-old sophomore from Menlo School, has been named a 2019 National YoungArts Foundation Merit winner in the voice/singer-songwriter discipline. 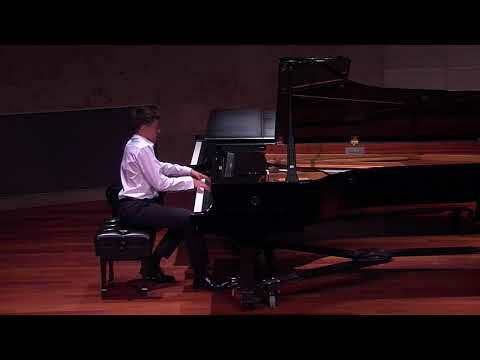 He will receive a cash award and opportunities to participate in YoungArts programs nationwide but said he most cherishes YoungArts' close critique of his songs. His winning songs were the first three he had ever written, in early 2018. Trained as a classical pianist and later in jazz, he said he borrows from the "touch" of all his idols -- from the passion and tenacity of David Bowie to the intricate voicing and whole-body movement of Chopin to the soft-yet-intense big-band sound of Bill Evans. He first heard about YoungArts from older friends who had participated in the contest as classical musicians. The submission of his songs had been mostly for fun. "Generally, I don't submit a lot of my own work," he said, but his decision to submit to YoungArts was driven by his desire for feedback. He took advantage of extra studio time during a classical recording session to record the three songs for submission. "My classical piano teacher was there -- it was pretty awesome. We set up a mic and just went for it," he said. Then he took those tracks home and filled out the application. For Jergovic, the biggest motivator in songwriting is his passion. "All the music I write is important to me in some way -- whether appealing to my mind melodically or harmonically, or based off some experience that's really influential in my life," he said. He credits his classical piano teacher, Dr. William Wellborn, for helping him find "what I loved about music and what I wanted to hear in my sound." He is grateful to his high school jazz teacher Leo Kitajima for helping him harness his potential in songwriting. "He taught me how to have a certain touch -- the way that you arrange chords, or draw from the keys with your hands, and the certain degree you apply." Asked about his ultimate goal in music, Jergovic couldn't pinpoint a future hoped-for moment of crowning glory. "I think the beautiful thing about music is you're always gonna find something new," he said. As he listens to more artists and puts modern twists on the works that resonate with him, "I keep on finding new outlets for my creativity." His most recent project is an album he co-wrote with his friend Aaron Morgan, titled "Old Green Records and L'Amour," released Jan. 8. "I'm just gonna take whatever sacrifice is necessary to get there," he said of the next milestone. "If I need to prepare for something, I'm going to practice as much as possible. I'm gonna find the time." Though he squeezes time between homework, water polo, and an acting career -- which includes voice work in "Toy Story 3" and theater castings with Palo Alto Players, Woodminster Summer Musicals, American Conservatory Theatre and Berkeley Playhouse -- music is still the foundation of his creative output. "In terms of things that I love," Jergovic said, "music comes first." ^ YouTube is your friend. The name Leo Jergovic is sufficiently unique to be easily searched. you can find the songs as part of the album Old Green Records and L'amour. with links on his official Youtube channel or in general searching for it on any music outlet. I can attest first-hand to your immense musical talent. That, with the tenacity and musical fearlessness you clearly possess, will undoubtedly propel you into a stellar musical career in any direction you so choose. You will be a household name within the next 20 years, mark my words!